If there are two words for wine in 2017, they’re experimentation and exploration…. These wine trends have a US/European focus but still embody global relevance and interest for the drinks industry. An unquenchable thirst for the new means wines made from less well-known grapes, such as Verdejo, and unfamiliar regions in Portugal, South Africa, and Arizona will gain buzz. The days when wine drinkers stuck with familiar brands, easy-to-pronounce grape names, and the standard bottle are gone forever. That doesn’t mean, however, that we’ll give up what we’ve already embraced—for example, prosecco and rosé, which have moved from fads to wine-world fixtures, with a few stumbles. More luxury versions of all, especially pink vino, are coming, which will, hopefully, put a quick end to the frosé (rosé slushie) eruption. Climate change remains high on my vinous radar. Scientists say 2016 was the hottest year on record, and while global warming may doom polar bears, a modest side benefit is the expanded boundaries for growing such grapes as finicky pinot noir. Think Germany, where spatburgunder (pinot noir) is better than ever, Canada, and Oregon, where the past few vintages produced top quality. Despite competition from craft beer (up 14.1 percent, according to Beverage Information group), cider (up 10 percent), and now flavoured whiskey (ugh), wine will still be going strong in 2017. Here’s what Bloomberg’s wine critic and columnist, Elin McCoy, sees in her crystal glass for 2017. Sparkling wine is positively effervescent in the US, the UK and even China, partly thanks to prosecco, but also because bubbly is rapidly becoming a drink for everyday celebration (and consolation). 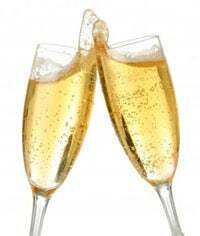 Champagne sales in the US, for example, were up 10 percent for the 52 weeks ended Sept 10. In 2017, I expect two sparkling categories to increase big time. Spanish cava, made by the same method as Champagne, is going upscale. A new designation to identify higher-quality bottles, Cava de Paraje Calificado (single-estate Cava), has just gone into effect. Also poised to grab attention is dry lambrusco from Italy. Like pét-nats, these are fun, crisp, and refreshing workday stress relievers—and white and red versions are beginning to show up on restaurant wine lists. Burgundy is still hot but ever more expensive, so the Loire will be the next cool-climate region to capture attention. Exports to the US were up 10 percent last year, and that number is sure to climb. There’s a lot to like at reasonable prices in the region: elegant and distinctive reds from cabernet franc and popular gamay as well as stylish, complex, dry and sweet whites from chenin blanc and lively, zingy sauvignon blanc. A couple of converging trends will boost light reds from everywhere. First, they tap into the rosé craze because they can be served lightly chilled, just like rosé, and offer pink-vino fans a way to expand their drinking horizons. In fact, all light fruity reds, such as Beaujolais and some pinot noirs, actually taste better chilled, because that points up their bright fruit and violet scents. Light reds are also part of the growing trend to cool-climate wines (see the Loire Valley above), perfect for everyday, year-round drinking: They don’t require aging, are highly versatile with food, and have plenty of flavour. Look for lively frappato from Sicily, tangy schiava and lagrein from northern Italy’s Alto Adige, pinot noir from Alsace, and zweigelt from Austria. … and cortas and other new packaging adventures, from the wacky to the luxurious. Case in point: The canned wine phenomenon boomed in 2016. Sales increased 125.2 percent in the 52 weeks ended on June 18, according to Nielsen. Although sparkling wine in cans has been around for a few years, now such wineries as Oregon’s Union Wine Company are putting the same Underwood pinot noirs they sold in bottles into single-serve cans for customers’ convenience. They’re easy to tote and chill, you don’t need a glass or a corkscrew, and they’re eco-friendly, too. In California, several top wineries—Sonoma’s Scribe, Napa Valley wineries Ca’ Momi and La Sirena—are introducing a new, short, fat bottle called the “corta”, inspired by ancient hand-blown vessels, for some of their wines. This trend isn’t just for everyday wines. Jay-Z’s Armand de Brignac champagne introduced the luxury fizz mini-bottle: 1,000 “purse-size” 187ml bottles ($150 each) of its expensive flagship Gold Brut. In October, the Dora Sarchese winery in Ortona, in Italy’s Abruzzo wine region, created a fontana del vino, a “fountain” that flows with free red wine. The idea was to offer refreshment to those walking the popular 196-mile Cammino di San Tommaso pilgrimage route between Rome and the Ortona Cathedral. People enter into a large barrel structure and fill their glasses from spigots above a stone basin. In Spain, Bodegas Irache in the Navarra region maintains one on a wall facing the pilgrimage route Camino de Santiago. Thousands have visited to serve themselves a free glass of wine. But the new Italian one in Ortona has captured the world’s attention: It’s the first to be open 24/7…..